15 년전에 내쉬빌에서 열렸던 지도자 훈련에 참석해서 감격했던때를 기억합니다. “내가 왜 여지것 이런것을 몰랐을까?” 억울해 했었습니다. 홀로 참석했던 그당시를 생각하고, 오늘의 여러 지도자님들과 함께 동행을 하게되니 새해가 더욱 기대 됩니다. 두달전 방문했던 양화진에 묻혀진 순교자들이 흘린 피의 열매로 우리가 사랑의 줄을 이어받았고 이제는 우리가 사랑의 줄을 세상에 던져야 할때입니다. 메리 스크랜턴 여사는 열악한 여성들의 인권 개선을 위해 노력해 오늘날과 같은 여성의 지위를 가져오는 큰 역할을 했습니다. 이런 선교사들의 노력이 없었다면 조선 여성들의 인권이 오늘날과 같이 부여될 수 있었을까요 ? 미국 감리교 여선교회는 선교부보다 선교에 앞장섰습니다. 스크랜턴은 미국과 조약을 맺기도 전에 조선에 대한 이야기를 듣고 조선을 위한 선교 모금에 앞장섰습니다. 그 아들인 윌리엄이 오게 된 것도 스크랜턴 부인의 힘이 컸습니다. 그 당시 어머니들은 지도자였고, 앞장 선 사람들이었습니다. 우리도 새해를 맞이해서 우리 아이들의 지도자 역할을 합시다. 한 해를 힘차게 달리며 앞서 나가십시다 ! Two months ago I had a privilege to visit Yang Hwa Jin, Foreign Missionary Cemetery in Korea. Because of the bloodshed by many martyrs, we received a Line of Love. Now, we must throw a Line of Love to the world. Mary Scranton played a big part improving women’s human rights. Mary Scranton started having fundraising for Korea before USA had treaty with Korea. 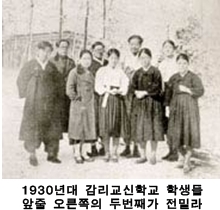 Was it possible to have Korean women’s right that they have today without the hard work of these Missionaries? United Methodist Women is one step forward than GBGM. Mary Scranton influenced her son William to come to Korea. Mothers at that time were leaders. Let’s be leaders for our children to have vision, courage and faith. 제가 15살 때 저희 가족은 선교 활동을 위해, 한국을 떠나 남미 볼리비아에 이민을 갔습니다. 볼리비아에서 3년 그리고 페루에서 2년 거주했고, 페루에서 고등학교를 졸업하게 되었습니다. 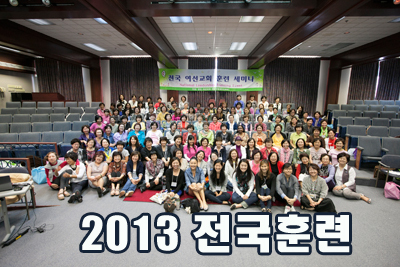 1968년 도미, 콜로라도주 덴버에 있는 Colorado Women’s’ College를 졸업했고, 그 이듬해 변종의 선생과 결혼 했습니다. University of Denver(덴버주립대)에서 화학석사 학위를 받고, 미국 내무부 산하의 연구기관인 U.S Geological Survey(미국 지질조사국) 에서 Research Chemist(화학연구원)로 10년 재직했습니다. 이후 Atlanta 소재의 U.S Geological Survey (미국 지질 조사국)으로 이직했으며, Georgia Institute of Technology(조지아텍)에서 분석화학 박사학위를 취득했습니다. 변종의 장로와 슬하에 두 아들 그리고 큰 며느리가 있습니다. 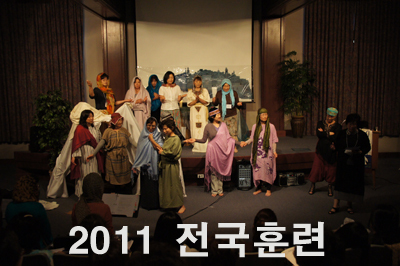 북조지아 연회 UMC에서 5년 동안 Korean Language Coordinator(한국어 코디네이터)로서, 2001에서 2004까지는 Korean Church Development Committee Member(한국 교회 발전 위원회 멤버)로 활동했습니다. 이후 팬아시안 커뮤니티 센터 (CPACS, 구 한인봉사센터)에서 이민자들을 위한 성인 문맹퇴치 프로그램의 Program Director(프로그램 책임자)로 12년 재직하며 베트남, 한국, 히스페닉, 난민 등 다양한 민족으로 구성된 연간 약 1000여 명의 학생들에게 교육의 기회를 제공할 수 있었습니다. 또한, 자연환경을 옹호하는 UMW에 Green Team 멤버로 활동했으며, 2008년 4월에서 2016년까지 두 임기 동안 여성국 이사로서, 2008년부터 2012년까지 General Board of Global Ministry의 이사로 섬겼습니다. I was born and raised in Korea until I was 15 years old. Our family then immigrated to Bolivia, South America in 1963. We lived for three years in Bolivia and two years in Peru where I graduated high school. Therefore I speak Spanish fluently. I came to the United States in 1968 to obtain a higher education. Upon graduation from Colorado Women’s College, I married my husband, Chong Pyen. I then attended the University of Denver where I obtained a Masters in Chemistry. I then worked for U.S. Geological Survey as a research chemist for 10 years. Later I was transferred to the USGS Atlanta Lab and enrolled at the Georgia Institute of Technology, where I received my PH. D. in Analytical Chemistry. Between my husband Chong and I, we have two sons, Joseph who married to Yeojin, and Daniel. 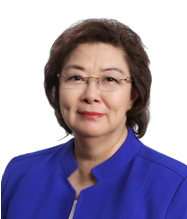 I served as a member of the Korean Consultative Group for four years. 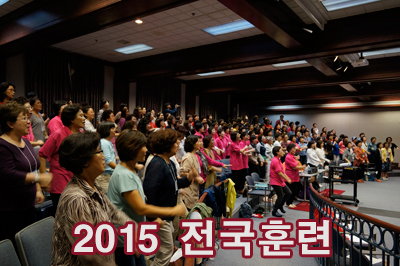 Furthermore, I served as a Korean Language Coordinator for the North Georgia Conference UMW for five years. I also served in the Korean Church Development Committee from 2001-2004, in addition, I was a Program Director for The Center for Pan Asian Community Services for 12 years. We serve about 1,000 immigrants per year. 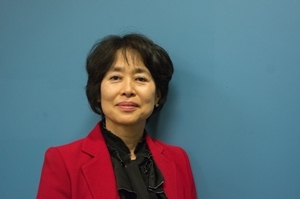 I oversaw the Adult Literacy program for Pan Asian immigrants. I am working as a Data Manager for the ESL Program. I worked as a victim liaison and a housing counselor. I served as a Director for Women’s Division in April 2008 through 2016, Board of Director for GBGM from 2008 through 2012. I was also a member of the Green Team Advocacy group for the environment. Since education is the best way to change one’s way of thinking, I give talks at the church circle and district retreats and workshops. This Earth is God’s creation, which we contaminated, and therefore we can clean up. I am a Vice President of the Atlanta-Roswell District UMW and now the incoming President in January 2018. 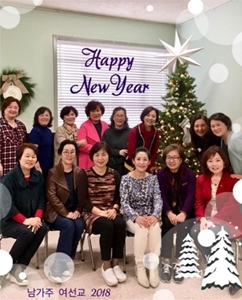 In addition, I am serving as a member of dCom (District Committee on Ordained Ministry) and now serving as a Chairperson of Committee on New Comers at Korean Church of Atlanta. I was raised in the Methodist church in Korea. My father-in-law Dr. Fritz Pyen was a Methodist Bishop in Korea. As the numbers within the Korean community are growing, we have a strong need for the preparation of younger generations. I believe I can contribute for a better future of greater inclusiveness of the UMC, one in Christ. 사명으로 부름받아 선교역사를 만들어가는 한인여선교회! 한인여선교회 전국연합회는 꾸준히 노력해가며 역사성을 이어가는 자랑스러운 한인연합감리교회의 기관이라는 칭찬을 들은 적이 있습니다. 이러한 칭찬에는 격려와 바램이 담겨있다고 생각합니다. 지난 2017년에도 300개 한인연합감리교회에 계신 여선교회 회원들이 같은 마음, 같은 비전, 같은 열정을 가지고 협력해 주셨습니다. 그래서 국내에선 한인여선교회 지도자훈련, Young Women 훈련을, 동북아시아 3개국에선 연합감리교회 여성 지도자훈련을 실시할 수 있었습니다. 이제 2018년을 맞이하여 우리는 계속해서 한인여선교회 역사를 써나가려고 합니다. 그 역사는 사명으로 써 나가는 선교역사입니다. 우리들이 부름받은 사명은 여성과 아동과 청소년을 위한 사역을 통해서 세상에 주님의 평화와 사랑을 전하여 신나고 행복한 하나님의 나라를 만들어가는 것입니다. 이 사명을 위해서 올해도 한인여선교회 회원들의 기도와 협조를 부탁드립니다. The NNKUMW is called to mission and making NNKUMW mission history! We have heard from others that the NNKUMW is being called a proud organization, and we are growing. Such a compliment gives us an encouragement and a greater sense of responsibility. As for the year 2017, the KUMW in 300 KUMCs has the same mottos: "One heart, One vision, One passion." During the year 2017, we hosted training seminars for Young Women as UMC women leaders in three countries. We will continue to write down NNKUW history in the year 2018. The history we write down is a mission story in the name of Jesus Christ. We are called to make the Kingdom of God for women, children and youth with the love of peace and love in Christ Jesus. For this upcoming mission work, let us pray and work together. New president and mission team elected at the general meeting of the NNKUMw National Training Event, 2017 . 회……회원들의 신나는 ‘남가주 여선교 연합회’가 되기를 기도드립니다. 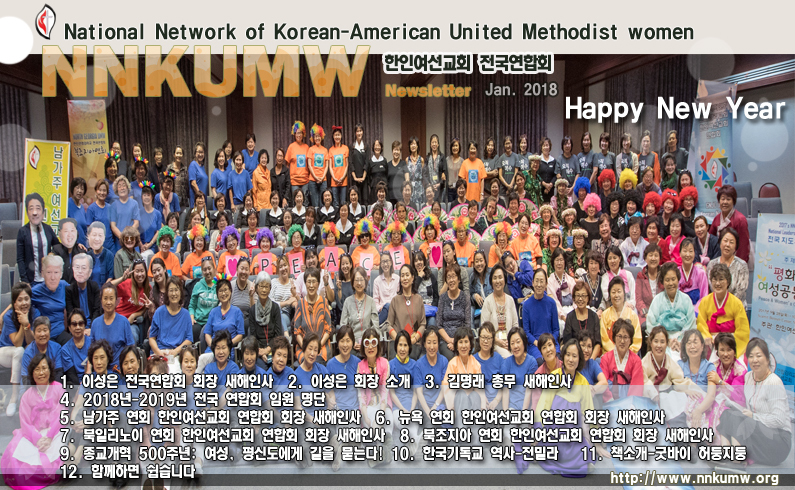 Happy new year to all members of Southern California KUMW. Thank you for your passion and participation throughout 2017 for the Southern California KUMW. We pray that we will come together in 2018 with a mission purpose. 뉴욕연회 한인여선교회 각교회 회장님과 회원들께 새해 인사 드립니다. 2018년도 새해를 주셔서 저희들에게 모든것을 허락해 주시고 다시한번 하나님의 자녀로 살수있도록 기회를 주신 하나님께 찬양과 영광을 올려 드립니다. 예수님께서 말씀하시기를 “첫째는 이것이니 이스라엘아 들으라. 주 곧 우리 하나님은 유일한 주시라, 네마음을 다하고 목숨을 다하고 뜻을 다하고 힘을 다하여 주너희 하나님을 사랑하라 하신것이요, 둘째는 이것이니 네 이웃을 네자신과 같이 사랑하라 하신 것이라. 이보다 더 큰 계명이 없느니라,” (마가복은 12:29-31). I thank God for the new year of 2018. He provides everything that we need, and gave us another year to live our lives as His children. Jesus says, “The most important one is this: ‘Hear O Israel, the Lord our God, the Lord is one. Love the Lord your God with all your heart and with all your soul and with all your mind and with all your strength. The second is this: ‘Love your neighbor as yourself. There is no commandment greater than these,” (Mark 12-29-31). Let us keep those words in our hearts. And as believers, we put one step out collectively with energy towards God’s kingdom. 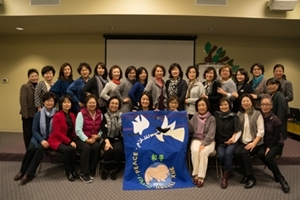 May all of us experience God’s grace and peace in the midst of our lives, in our church lives and in our lives with the Korean United Methodist Women in the year 2018. 북일리노이 여선교회 연합회를 부회장 장경순 권사님과 함께 2년간 회장을 맡은 조인나 권사입니다. 올 시카고의 매서운 겨울 추위와 함께 2018년이 시작이 되네요. 새해 복 많이 받으시고, 우리 일리노이는 물론 전국 여선교회 회원님들의 가정과 교회에 하나님의 은혜가 충만하시길 기도합니다. 지난 11월 총회 때 회장으로 피선되어, 12월에 어렵게 첫 임원회를 마쳤습니다. 저의 부족함을 절실히 느낀 시간이었지만, 하나님께서 함께 해주시면 감당할 수 있으리라 하는 믿음 또한 주심에 감사를 드렸습니다. 올 한해 함께하면 어렵지 않다는 믿음으로 주님과 동행하는 우리 북일리노이 여선교회가 되기를 희망합니다. 그리하여 우리들의 작은 씨앗이 하나님 나라 확장에 작은 몫이 되길 또한 희망합니다. 감사합니다. I am Inna Cho and I was appointed as the President of Northern Illinois Conference (NIC) KUMW Network with Vice President, Kyung-Soon Jang for the next two years. We are starting the new year with a bitterly cold winter here in Chicago. Happy New Year to all our KUMW members and I hope all of you have a blessed New Year with your churches and families. I was given the chance to lead a cabinet meeting for the first time last December after I was elected. I felt like I lacked in certain areas as president, however I have faith that when God is with me, I have the power to complete the mission. When we do God's work together, we will be able to overcome challenges and I hope our NIC KUMW will trust in the Lord. I am Praying that our small seeds will expand kingdom of God. 우리에게 언제나 축복 주시기 원하시는 주님의 이름으로 북조지아 여선교회 회원 및 전국에 계신 여선교회 회원 여러분께 새해 인사드립니다. 새해에는 여러분들의 뜻하신 바를 주안에서 이루시고 기도하는 모든 제목과 소원들이 이루어지는 한 해 되시기 소원합니다. 해마다 돌아오는 새해이지만 올해에는 특히 우리에게 선물로 주시는 365일을 하나하나 열 때마다 예비하시고 준비하신 주님의 선물을 받으시는 감동과 기쁨의 한 해가 되시기 바랍니다. 방방곡곡 지구 구석구석 하나님의 사랑과 복음의 외침이 울리고 넘치는 귀한 일을 보기 원합니다. Happy New Year to all United Methodist Women in the North Georgia, and all United Methodist Women across the world. This year, I hope you made your goals and resolutions in Jesus Christ. Each of these up and coming 365 days are a gift from God and I hope, through his preparation and support, that you will gain pleasant surprises as you receive each one. God is good and he gains glory and praise from those who step into their mission in all the corners of the world to spread his love and gospel. From this mission, may you see his good works and bask in the fruits of his glory. This year, I love you all and wish you a God blessed new year. 올해가 종교개혁 500주년을 맞이하는 해이다. 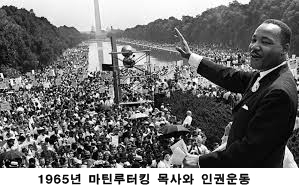 세계곳곳의 교회와 기관들에서 종교개혁 500주년에 대한 학술강연회, 세미나, 예배, 등이 이루어지고 있다. 그런데 뉴욕의 후러싱교회에서 매달 수요일마다 종교개혁 500주년을 기념하여 세미나를 갖고 계시는데 이 행사에 평신도 여성의 입장에서 강사로 초대받아 이 자리에 서게 되어 영광이다. 초청해 주신 김정호 담임목사님과 성도들께 감사를 드린다. 종교개혁 500주년은 다양한 의미를 갖고 있지만 평신도 여성의 관점에서 보고자 한다. 1903년 SS 겔릭호를 타고 104명이 하와이 사탕수수 농장으로 104명의 최초의 이민을 떠나 1905년까지 총 7,266명이 이민을 오게 된다. 그 이민자들 가운데 이화학당을 비롯하여 미국의 여선교사를 통해서 교육을 받은 신여성들이 있었다.그들은 하와이에 도착하여 교회를 짓는 데 동참하고 자녀들에게 신앙교육과 한글 교육을 시켰다. 하와이 사회에서는 애국부인회, 적십자, 등을 조직하여 조국의 독립운동을 후원하였다. 특별히 여성들은 사탕수수 농장에서 인종차별 받으며 고된 노동을 하며 어렵게 살다가 부업을 해서 번 돈으로 남편들을 농장에서 나올 수 있게 하고 개인 비즈니스를 시작한 강인한 이민 아줌마들이었다. 1965년 마틴 루터 목사의 인권운동 결과로 1970년대 아시아 이민의 문이 열리자 한인 이민자들이 캘리포이나, 뉴욕, 등 대도시로 집결하게 되 고 곳곳에 한인교회들이 설립되었다. 여성들은 가정에선 아이들에게 훌륭한 교육을 시키려고 노력하였고, 사회에선 이민 여성으로 힘든 일들을 감당하며 가정경제를 책임졌고, 교회에선 성도들을 섬기는 일인삼역을 감당하는 사람들이 되었다. 그 결과 한인 자녀들이 미국 사회에서 훌륭한 사회인들이 되었고, 한인사회가 크게 발전을 하였으며, 한인교회가 50개 주에 설립되었다. 지난 113년의 한인 이민역사의 주역은 이름도 없이 자신들을 희생하며 억척스럽게 살아온 우리 한인 여성들이라고 생각한다. 그래서 농담으로 한국에는 남성과 여성이 있지만, 미국엔 남성과 여성과 이민 아줌마가 있다고들 한다. 한인 여성들이 종교와 문화를 넘어서 이 땅에 뿌리를 내리려고 얼마나 노력했는지를 이 자리에 앉아있는 우리들은 잘 알고 있다. 그래서 한인 이민 여성들을 광야에 있는 우술초인 세이지(Sage) 같다고 볼 수 있다. 들풀이지만 물도 없는 척박한 땅에서 강인하게 솟아 나와 향기를 발하며, 정결케 하며, 치유하는 성분도 가진 세이지가 바로 한인 이민 여성들의 모습이다. 미국 역사에서 보면 백인들이 흑인들을 노예로 잡아다가 사고팔던 시대에 자신들의 행위를 정당화하기 위해 흑인은 영혼이 없으며 하나님께서 종살이하도록 창조하셨다는 성서해석으로 백인 교인들을 가르쳤다. 그러나 흑인들도 성서를 읽고 신학을 공부하면서부터 백인들이 잘못 해석한 성서로 인해 기독교가 저지른 죄악을 발견하게 되었고 그 후 성서해석이 달라졌다. 마찬가지로 여성들도 오랜 기독교의 역사 속에서 보면 남성 문화권에서 남성 중심의 성서해석을 하여 인류의 반이나 되는 여성들의 역사는 반영이 되지 않았다. 그래서 어쩌면 인류역사가 반쪽역사, 반쪽문화, 반쪽신학으로 발전해 온 것은 아닌지? 여성 신학자들은 이제는 온전한 문화, 온전한 역사, 온전한 신학이 수립될 때가 되었다고 외친다. 하나님 안에서 차별하는 사람도, 차별받는 사람도 없는, 노예도 주인도 없는, 그리고 남자도 여자도, 모든 인종이 다 귀중한 사람으로 대우받는 세계가 될 때, 이 세상은 온전해지고 평화로워질 수 있다고 주장한다. 이것이 바로 우리가 매일 암송하는 “하늘에서 이루어진 것 같이 땅에서도 이루어지이다”하는 주기도문의 성취라고 말하고 있다. 하나님이 인간의 모습으로 이 땅에 오신 이유가 바로 이런 세상을 만드시려고 오셨고, 우리에게 이렇게 살라고 가르치셨고, 이 일을 성취시키기 위해서 돌아가셨다고 말한다. 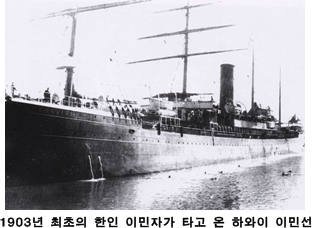 For the first time in 1903, 104 Korean people immigrated to Hawaii via the SS Galic, to work on a sugar cane farm. The number of Korean immigrants grew to 7,266 by the year 1905. Among the immigrants were educated women from Eiwha School run by the American women missionaries. 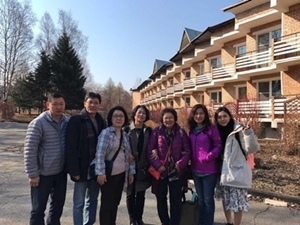 They participated in building churches and educating children in the Korean language and Sunday school education. 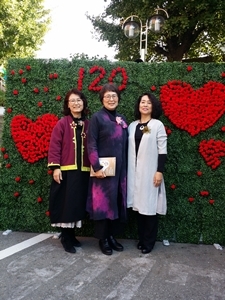 The Hawaiian Korean community organized by the Patriotic Women Society, was backed by the Red Cross to support the homeland’s independent movement. 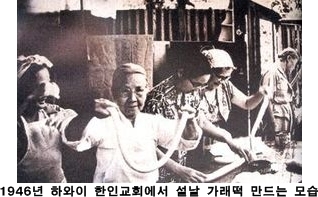 The Korean women immigrants were strong. They worked harder to earn extra money in the midst of racism and hard working conditions, saving their gains in order to open their own businesses and stop farming. During the 1970’s, the immigration law opened the door for Asia because of the 1965 Civil Rights movement by Rev. Martin Luther King Jr. This was the beginning of Koreans moving to America and gathering in the cities in California and New York. Wherever they went, they established churches as a gathering place. At home the Korean women tried to educate their children as best as they could while at work they tried hard to help family finances. 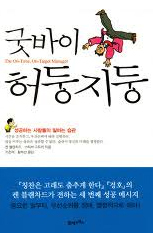 The next generation of Korean children became successful and responsible persons of society. As a result, the Korean American community flourished and Korean churches were established in all fifty states. 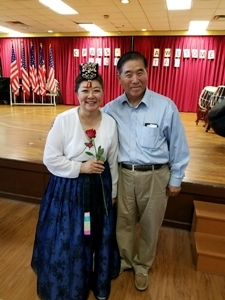 It is not an exaggeration to say that in the past 113 years of Korean American immigration, Korean women were the major force to establish the strong, successful community by their hard work and self-sacrifice. We all know how much Korean women immigrants tried to establish their families by overcoming the differences in culture, language and religion. 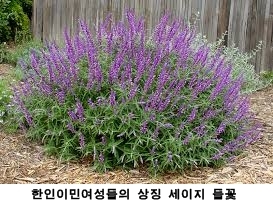 Therefore we can say that the Korean women immigrants can be compared to the Sage in the wilderness hyssop. The sage in the wilderness is wild grass that burst out to produce fragrance, to purify and to cure, which represents the features of Korean women immigrants. When we look back in American history, the slave owners were Christians who believed that black people did not have souls and were created for slavery. Those who had the power to sell humans as slaves said things that justified their actions. When black people began to read the Bible and study theology, they realized that the white slave owners were wrong and misinterpreted the bible, and discovered the crime that they committed. After facing the truth of Bible teaching, the interpretation of the Bible changed. As we look at the issue of slavery, we also can see the long history of discrimination against woman even in the history of Christianity. In the male-centric culture, the Bible interpretation has been in the favor of men. The other half of the entire population, woman’s history, has not been reflected. This may be why human history is only half represented, which is the same in culture, in theology. The women theologians demand that it is time to establish a whole culture, whole history, and a whole theology. According to God, there should not be any people who discriminate others or people who are discriminated against. There should not be any people who are treated as slaves nor people who act as an owner of other people’s lives. 지난 해를 뒤돌아 보니 우리 모두 얼마나 바쁘게 살았나? 할 일도 많았고, 만날 사람도 많았고, ...정신없이 한해가 후딱 지나갔다. 그런데 우리는 늘 그렇게 바쁜 일상, 혹시 허둥지둥 살았던 것은 아닐까? 어떤 일이 중요하고, 그래서 어떤 일부터 해야 하는지, 그런 것조차 생각지 못하고 일에 파묻혀 허둥지둥 하다가 그냥 흘려버린 시간들, 또 꼭해야 되는데 미루다가 못했던 일들은 혹시 없는가? ‘굿바이허둥지둥’ 이 책은 이렇게 일에 묻혀서, 시간에 떠밀려서 허둥지둥 살아가는 우리들의 모습을 들여다보게 해주는 책이다. 일의 우선순위를 따져 제 시간에 맞게, 상황에 맞게 움직이는 사람들의 습관을 재미있는 이야기로 풀어낸 자기계발서이다. 우리에게 잘 알려진 ‘칭찬은 고래도 춤추게 한다’ 의 저자인 캔 블랜차드는 우리가 얼마나 하찮은 것들에 매달려서 정작 소중한 것을 놓치고 살았는지에 대해 돌아 볼 수 있게 해준다. 저자는 '정말 하고 싶은 일'과 '해야 하는 일'의 우선순위, 일, 파트너, 상황에 대한 타당성 찾기, 헌신에 대한 중요도 수업을 듣고 인생이 풍요로워 진 밥이라는 사람을 소개한다. 그리고 이를 통해 중요한 일부터, 우선순위를 정해, 열정적으로 일하라는 것을 강조한다. 또한 개인의 열정을 불러일으키는 방법 중 가장 효과적인 방법은 '하고 싶은 일을 하는 것'이라는 것도 알려준다. 누구에게나 똑 같이 주어지는 시간인데 어떤 사람들은 늘 ‘바쁘다 바뻐’라는 말을 달고 살면서, 일을 미루고, 시간에 쫓기며 살고 있는데, 또 어떤 사람들은 다 똑같은 시간인데도 허둥대지 않고 주어진 일을 여유롭게 하며 산다면 그 이유가 무엇일까? 이 책을 통해서 발견하길 바란다. 새롭게 주어진 2018년, 올 한해 내 인생의 우선순위가 무엇인지, 또 중요한 일이 무엇인지를 발견하고, 허둥대지 말고 살았으면 한다. Looking back on the past year, how busy were we all living? There was a lot to do, a lot to see, and a year flew by so quickly. But aren't we always so busy, perhaps, flustered with our daily lives? Are there any times when you were lost in a flurry over your work and couldn't think about what's important and what to do first? Or did you ever put off doing anything that you had to do? This book is a reminder of how we are living in a flurry under the pressure of work and time. It is a self-help book that unfolds the habits of people moving according to the time and situation by prioritizing work with interesting story. Ken Blanchard, a well-known author of “Whale Done" lets us look back at how trivial the things we hang on to and miss what is precious. The author introduces Bob who is enriched in life by taking lessons about the importance of finding priorities, work, partners, relevance to the situation, and commitment of "what I really want to do" and "what I need to do". And he emphasizes the importance of prioritizing and working enthusiastically from the important things. Also, the most effective way to encourage individual passion is to 'do what you want to do'. It is the same time given to everyone. Some people, however, always live with the words 'busy and busy', putting off work and being pressed for time. Then why do some people live at the same time, but do not falter, and get their work done in a leisurely manner? I hope you find it through this book. I hope you find out what your priorities and important tasks are this newly given year 2018, and not live in a flurry.